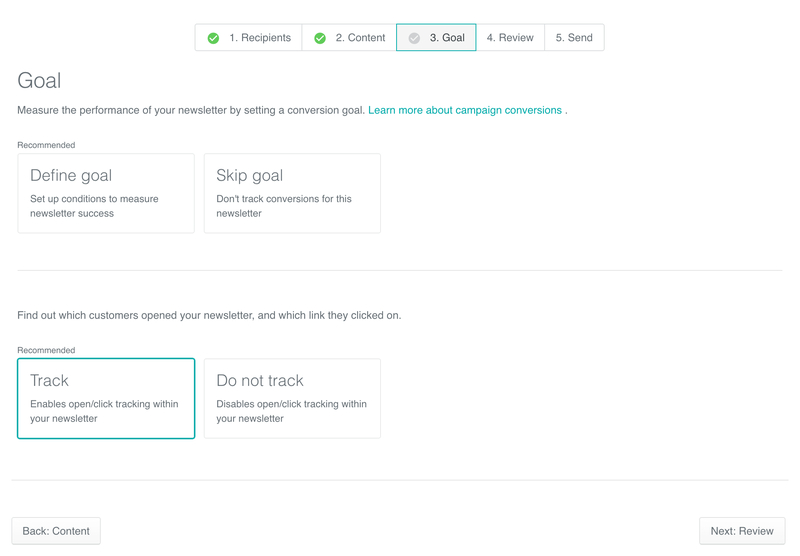 For each campaign or newsletter you're sending through Customer.io, we allow you to set a conversion goal: mark a user as 'converted' when they enter or leave a particular segment. This allows you to attribute a conversion to a specific message or action. In Customer.io, it's both a goal and a metric. First, you set your conversion goal segment — then, when a customer enters or leaves that segment (for example, they paid for a plan and entered a 'premium' segment), Customer.io looks for the last delivery before the conversion goal was met, and attributes a conversion to that delivery. This is because we don't know the nature of Slack, Webhook, and attribute update actions. These are often internal or used for analytics purposes, and aren't always sending messages to end-users. For that reason, we don't attach conversions to them. Take a look at this example workflow, and assume we've set a conversion goal. If a user enters our conversion segment and the last delivery was Welcome Email #1, then the conversion is attributed to that email. If they enter the segment after receiving the Twilio SMS, the conversion is attributed to the SMS. However, if they enter the segment after the Trello card is created, the conversion goes to Email #1, and if they entered the segment after the attribute was updated, Email #2 gets the conversion. Note: We do not retroactively count conversions. Our conversion numbers will only include people who convert after you add (or update) the conversion goal. They do not include people who previously met that goal. Updating a conversion goal will not update your conversion metrics for messages that were previously marked as converted. The first opportunity to set your goal occurs when you're first setting up your campaign. Or you've already started a campaign, you can set its conversion goal under the Goal & Exit tab of the campaign overview. When you choose to Define Goal, you can choose which conversion segment a user should enter or leave, and optionally define a time window for that conversion. Where can I see conversion metrics? click on the Converted bar in the campaign metrics, seen in the above screenshot. filter Delivery Logs for User Actions > Converted. You can do this for emails, Customer.io Push Notifications, Twilio, or Urban Airship Push notifications. How do I know if a specific user converted? Will people continue to move through campaigns once they convert? Yes. By default, customers move through your triggered campaign, even if they converted. For example: if your conversion segment has the rule "UserStatus is equal to premium", the filter segment will need to have the rule "UserStatus is not equal to premium".